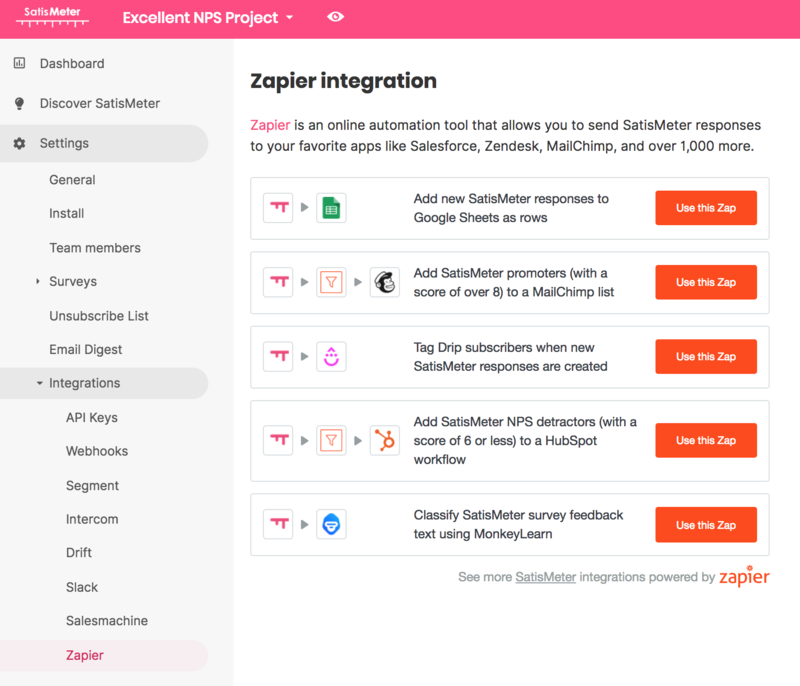 Zapier is an online automation tool that allows you to send SatisMeter responses to your favourite apps like Salesforce, Zendesk, MailChimp, and over 1,000 more. 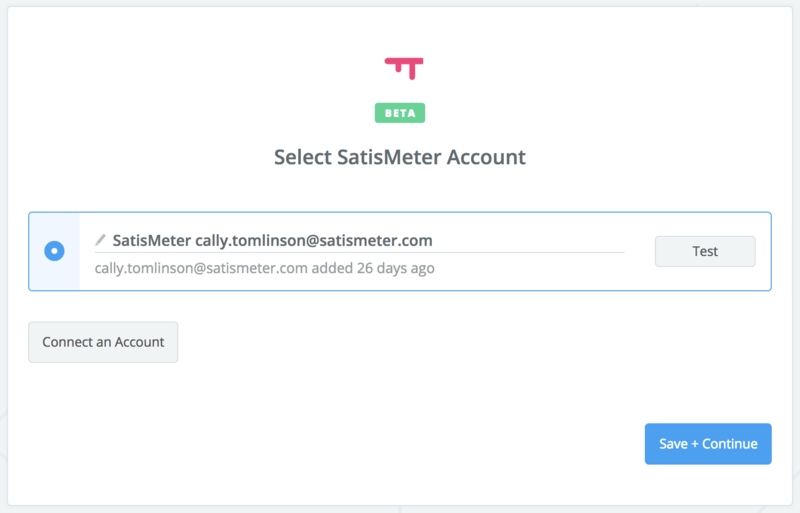 When X happens in SatisMeter, Zapier can instruct a second app to do Y. These steps are referred to as a trigger and action. 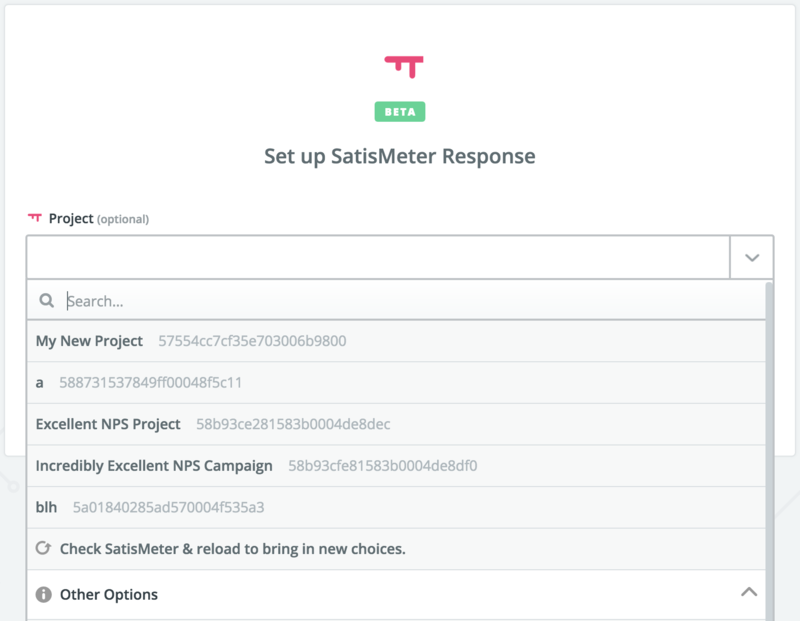 We're going to walk you through the steps to create a new Zap with SatisMeter. Right now our application in Zapier is in invite-only mode. 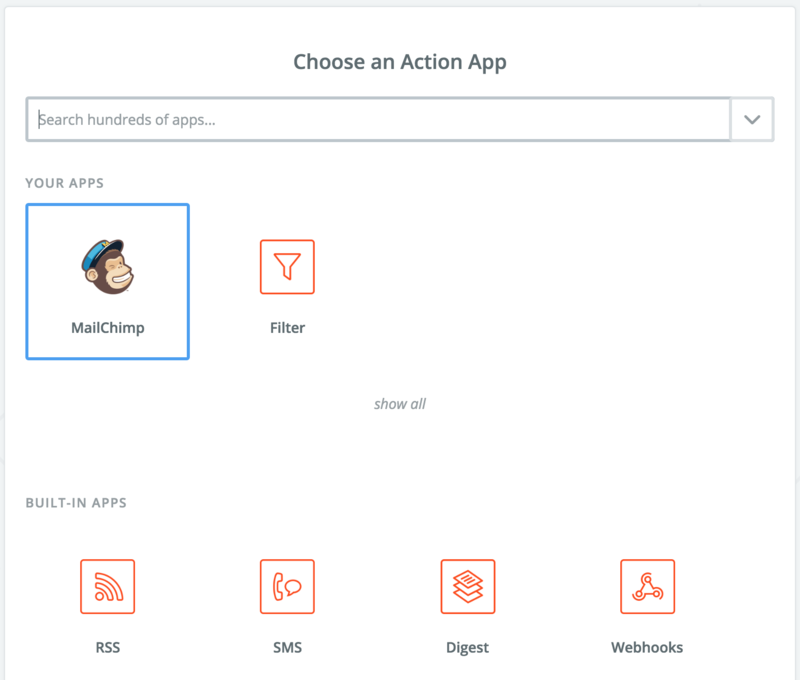 You can click in the "Connect Zapier" button in our integrations page. 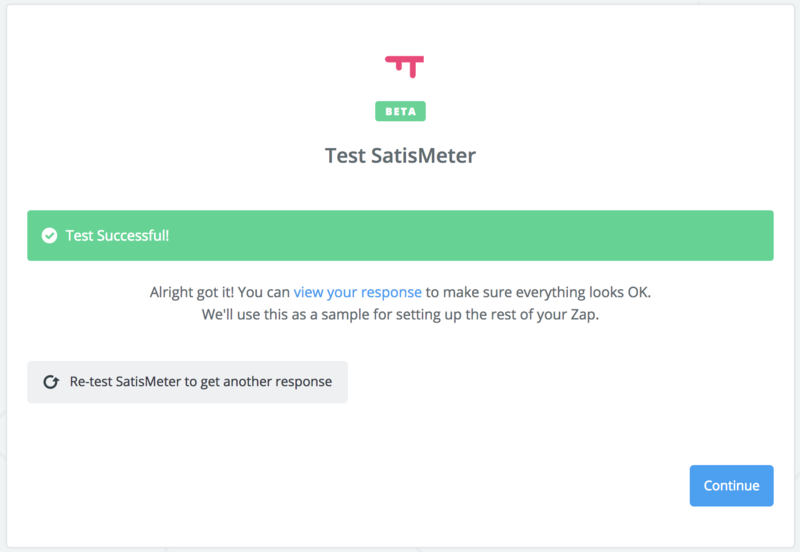 SatisMeter should now be available for you to use in a Zap. You will now see the screen in which you can create a Zap. Click on "Create this zap"
1.1) Choose the trigger you wish to use, and click "Save + continue". You will be able to refine this trigger later on (ie. include only promoters/detractors). 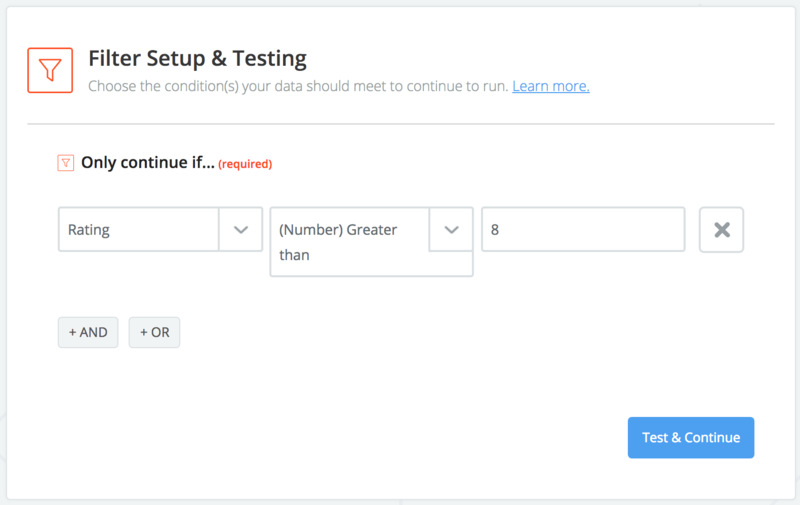 1.2) In this next screen, you will need to connect your SatisMeter account, by clicking "Connect an Account"
1.3) A pop-up will open where you can login with your account or register an account. If you are already logged in, you will have to allow the integration with Zapier. Then click "Continue". 1.4) In this screen you will see a dropdown, which will list the projects you have in SatisMeter. Select the project for which you want to create the trigger. 1.5) The next step is to test the connection with SatisMeter. Click "Fetch & Continue". If everything is working, you should see a screen like the one below. Adding a filter to your trigger is not necessary, however, if you wish to make the action conditional on the type of response your receive this is how to do it. In this example only Promoter responses (scores of 9 or 10) will act as a trigger. Responses with lower scores will be ignored by this Zap. 2.1) In the left hand options click the + symbol between trigger and action, select Filter and continue. 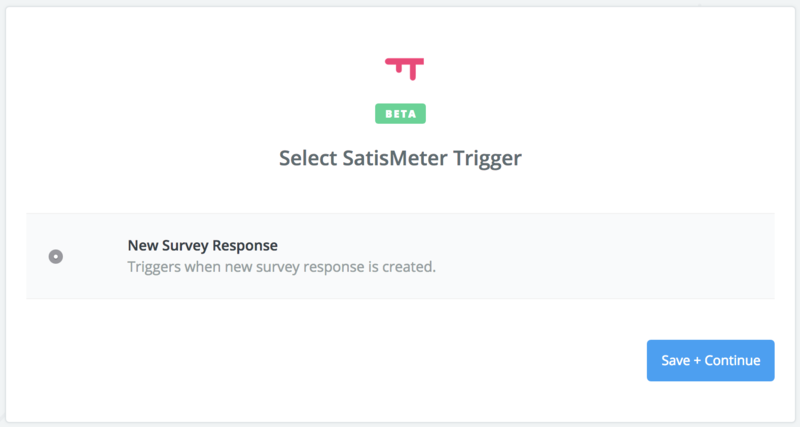 2.2) Choose the conditions which a survey response must meet in order to trigger this action. We will target promoters by filtering for ratings greater than 8, but the options are extensive. You could look for particular key-words, user attributes, or times and dates. 3.1) Select the service you want to use in the action. 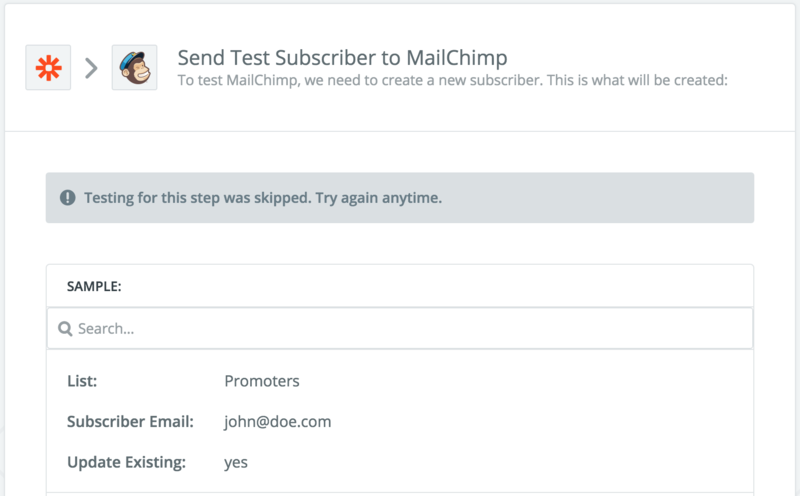 In this example, we will add all promoters to a MailChimp List. 3.2) Select the action, eg: "Add/Update Subscriber". 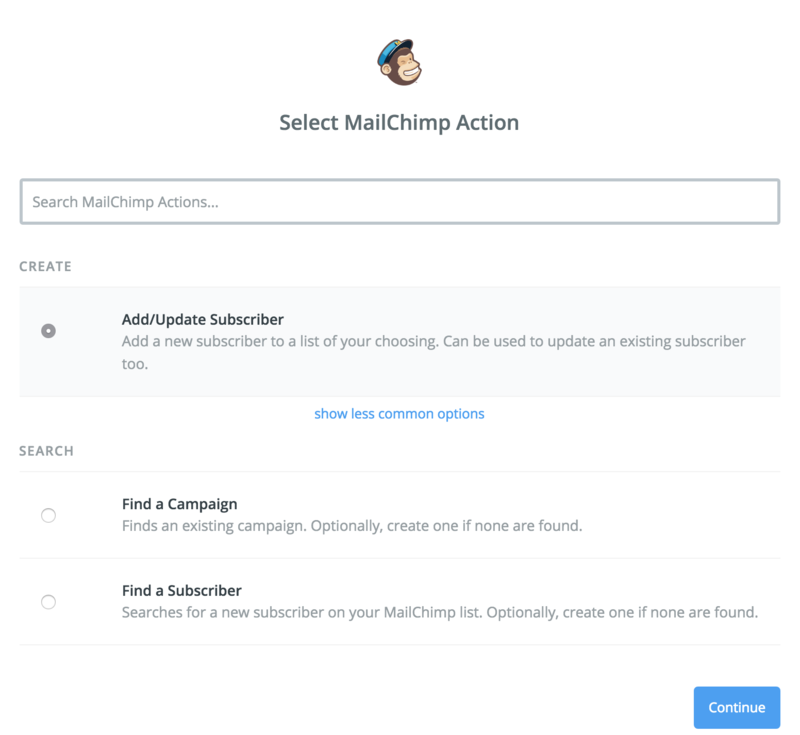 And click "Save + Continue"
3.3) Connect your MailChimp account and "Continue"
3.4) We now need to tell MailChimp where and how to subscribe new promoters. Select the List you wish to add Promoters to. Identify the Subscriber e-mail by selecting "New Survey Response" and then "User Traits Email" in the drop down list. Configure any extra settings you need. 3.5) In this step you can test the connection, or skip a test. Then click on Finish. 4.1) Congratulations, you've just created your first Zap!! 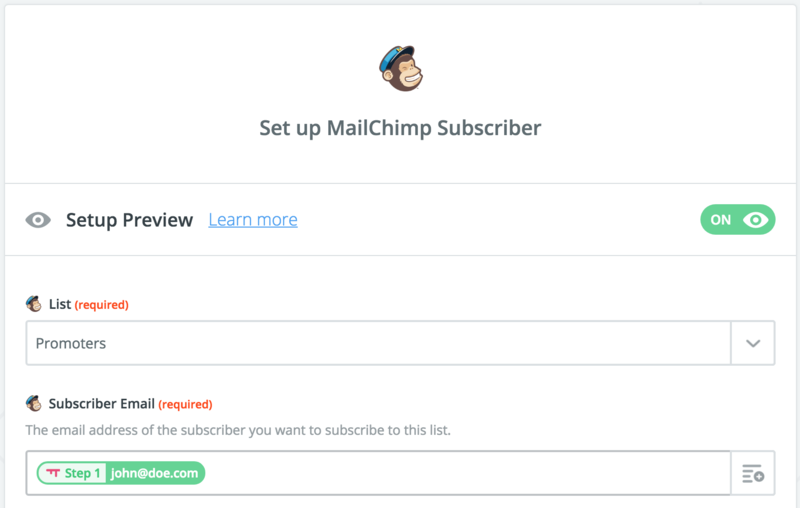 You will now add any user leaving feedback of 9 or 10 to a MailChimp list. 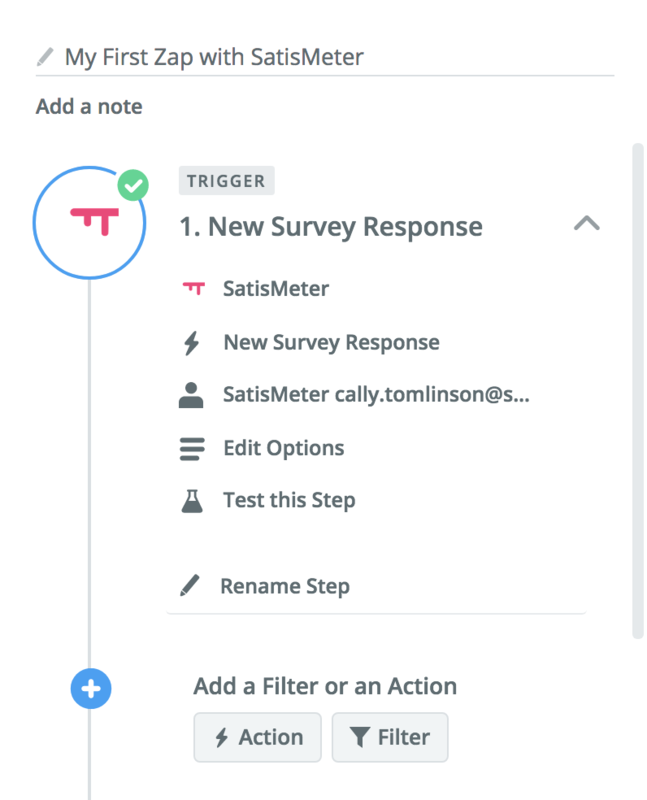 This same process can be used to complete actions in 1000's of apps, depending on triggers determined by your feedback.